This cute little Angora rabbit will watch everyone for you over its paws! This decal looks great on light-colored laptop lids and other flat surfaces. Dark purple areas in first listing photo are negative space on the die-cut vinyl graphic. There is no clear backing material. Vinyl is rated for up to 6 years of outdoor durability and uses a permanent acrylic pressure-sensitive adhesive. Decals are waterproof and removable but are not reusable. They can be applied to any smooth flat surface (e.g. glass windows, water bottles, rubber rain boots, laptop lids, phone covers, etc.) Graphics designed and cut in-house. Please note that these stickers should not be used on walls as the permanent adhesive on the vinyl may pull paint off upon removal. 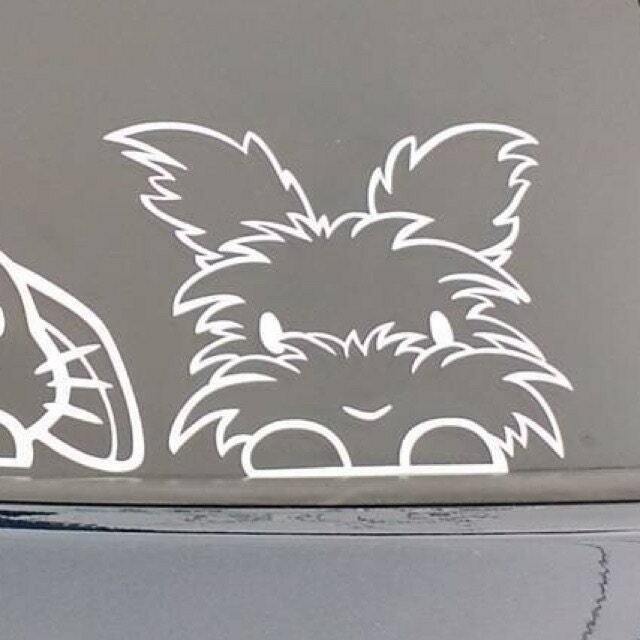 For a custom colored sticker at no additional charge, please add a note with the permanent vinyl color you would like for your decal during your purchase. Available colors are listed in the last product photo. For a custom size not listed in the variations, please contact us for pricing. Artwork and design, Copyright © 2015 A. Liang, SS Bunny Imports. All rights reserved.